After the devastating stock market crash of 1929, one would think that a massive, emotion-fueled over-inflation of the market would never happen again. After all, didn’t we learn our lesson the first time? So we thought, until the dot com bubble. 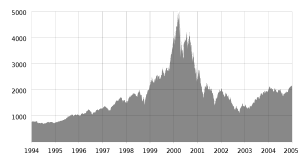 If you click the image above, you will get a closer look at what happened when the dot com bubble burst on the NASDAQ. A sharp increase in the late 90’s followed by a devastating loss in the early 2000’s. While there are similarities between the two, the 1929 crash and the dot com bubble differ in several important ways. In both cases, uninformed investors began speculating and saw the stock market as their ticket to easy riches. People only saw the rising value of stocks and didn’t know how to actually value the shares. They bought into the hype, chatted with other novice investors about hot stocks and bought like crazy. After the 1929 crash, investors and economists should have been able to prevent the 1990’s super-charged dot com bubble buying environment – but they couldn’t. One important factor that set the dot com bubble apart from any other in the past was the unknown nature of the company’s people were buying stock in. In 1995, people began to see the benefits of an online presence in their business. Those with a website could connect more readily with customers and reach a wider audience. Soon, entrepreneurs realized that they could build an entire business online and ecommerce was born. With the media hype about the low costs and massive returns of online commerce, everyone was after a piece of the pie. The problem was that even seasoned investors didn’t know enough about the nature of this new online business world to properly research the players involved. This created an environment rife with bogus companies, falsified records and unknowledgeable excited investors, a recipe for disaster. Unfortunately, the economists who should have been sounding the alarm kept their dissenting opinions to themselves for the most part. No one wanted to be the unpopular voice speaking out against this brave new business frontier! It would have been hard to prove anyway, considering that most average investors had no idea what an online business was really worth, or even how it was operated, beyond what they were being told by the companies themselves. The spring of 2000 saw the dot com bubble burst as investors realized how wildly overvalued their internet and technology stocks had become. This downward spiral continued well into 2001, wiping out small-time investors who had placed too much confidence, and money in the market. A few companies made out like bandits – mostly those who had sold off before the bust. Those multi-million dollar deals had only served to fuel the hype, as people across the country saw previously unemployed students and techies become instant millionaires upon the sale of their company’s. An unfamiliar business model, scam artists and massive media hype certainly contributed to the disaster that was the dot com bubble, but beyond the surface, the underlying mechanics are the same as any other financial bubble. Uninformed investors, speculators and emotional buyers flood the market, causing an unrealistic rise in the value of securities. If we are to avoid these booms and busts in the future, we must learn to recognize the characteristics of such a market and avoid it at all costs.